The workshop you have been waiting for! Learn how to create your own sculptural forms and benches to cover in mosaic. 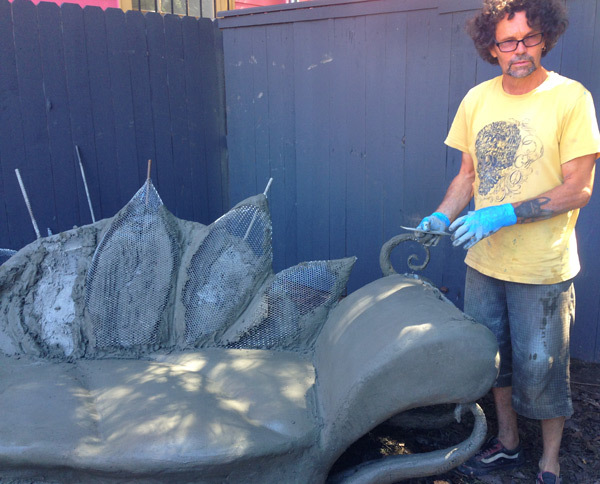 In this 3-day experiential workshop students will work as a team with Master Sculptor Brent Sumner from New Zealand, to create a three-dimensional concrete form as a base for a fantastical mosaic bench. The workshop is part demo and part hands-on building. Students will learn how to make an armature for a sculptural bench and how to apply and sculpt layers of concrete on the armature to create a unique, organic form. This real-time, nuts and bolts workshop will cover various techniques used to create concrete-based sculptural forms of different sizes, including how to create structural strength through shape. Brent will discuss different approaches to creating weight bearing sculptural forms, play structures, functional benches and creative sculpture. Students will jump right into making process, while learning which materials to choose for different types of forms, in different environments. Finally, students will learn how to finish a sculptural form to receive range of different surface finishes and specifically mosaic.This is a great opportunity to be part of a creative team, actively building a fantastical, yet functional form. New Orleans is beautiful at this time of year and True Mosaics Studio is a great place to build community while building beauty and having fun. Minimum must be met by August 8, 2015 for the workshop to run.. Sign up early! Brent Sumner has been designing and creating large-scale sculpted artworks for the past 15 years. Hailing from New Zealand, his origins lie in sculpted earth buildings, woodworking and performance art. Brent currently works with a variety of mediums to create fantastical sculptural forms and buildings, including steel, wood and Darjit. Brent developed the architectural sculpting compound darjit, a material made from recycled paper and by-products from clay mining. The development of Darjit influenced Brent's approach to sculpture building as it is lightweight, extremely versatile, and it allows for a wide variety of effects and fine detailing to be achieved when sculpting with it. Brent has since been commissioned to build many large-scale sculptures and installations around the world, including a 12-foot dolphin form for a festival site, a 30-foot floatable whale for a performance in Doubtless Bay, New Zealand, the celebrated Dragon Gate, a sculpted entrance with two large dragon-entwined columns, framing an intricate steel gate. Brent has also created several sculptural exterior garden installations that incorporate fountains, plantings, lighting, fireplaces and intimate gathering areas.